Another bullwhip by Terry Jacka, purchased via ebay. 8ft/12plait thong, going downto 6plait at the fall connection. Perfectly broken in by its former owner. 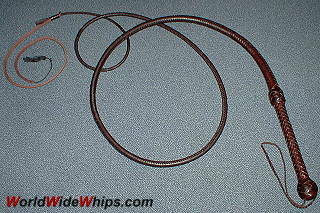 This type of whip was used in the Batman movie by "Catwoman" Michelle Pfeiffer. 8ft was the standard size.